Burgess tell me there’s been a currency change from euros to dollars and a $9 million price reduction on the 61.3m motor yacht New Sunrise. Built by CRN in 2000 to a design by Studio Scanu, New Sunrise is Lloyds classed and MCA compliant. This iconic superyacht has been maintained to the very highest levels and has an interior designed by Francois Zuretti featuring cherrywood panelling throughout. At its heart is a magnificent 80 square metre saloon which has a number of different seating areas and is perfectly suited for entertaining or relaxation. 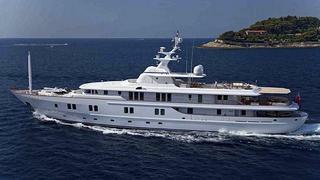 Accommodation is for 12 guests in a master suite, VIP, three doubles and one twin cabin, each with ensuite bathrooms. Expansive deck areas include a large sundeck complete with Jacuzzi.